The Crystal Jellyfish is a species of jellyfish known by the scientific name Aequorea victoria. Its is best known for its crystal clear body from which is gets its name, and its bioluminescence. Bioluminescence is simply light produced by a chemical reaction which originates in an organism. It can be expected anytime and in any region or depth in the sea. Bioluminescence is a primarily marine phenomenon. It is the predominant source of light in the largest fraction of the habitable volume of the earth, the deep ocean .In contrast, bioluminescence is essentially absent (with a few exceptions) in fresh water. Bioluminescence of Aequorea, as in most species of jellyfish, does not look like a soft overall glow, but occurs only at the rim of the bell (the localization of bioluminescence in jellyfish appears to be genus- or species-specific), and would appear as a string of nearly-microscopic fusiform green lights, given the right viewing conditions. Aequorea medusae used to be enormously abundant during the summer in Friday Harbor, Washington State, during at least the 1960s through the 1980s. Hundreds of thousands of medusae were harvested during that period by scientists interested in their luminescent properties. Aequorea medusae have become relatively scarce in the 1990s and 2000s and we do not know why - this change does not seem to be due to over collection. The entire population of Aequorea medusae disappears (dies) by mid-autumn every year. Polyp colonies persist on the bottom and produce a new generation of medusae each spring, using specific, but undetermined, environmental cues for the fairly precise timing of this annual event. Sadly, they can only live from 4-6 months. The Crystal Jelly keeps the plankton population stable. The crystal jelly lives in pelagic waters in the Pacific Ocean from Vancouver, British Columbia, to central California. They keep the food chain balanced. Some species of fish, other jellyfish, and sea turtles eat Crystal Jellies. as you can tell this Crystal Jelly has wide bell and there is a little part of the fluorescent color showing. This is the view of where all the crystal jellyfish are located. They live in open oceans from the coasts of Vancouver to California. The Crystal Jelly keeps the plankton population stable. The crystal jelly lives in pelagic waters in the Pacific Ocean from Vancouver, British Columbia, to central California. They keep the food chain balanced. Some species of fish, other jellyfish, and sea turtles eat Crystal Jellies. Their preferred food, copepods, comb jellies, and other hydromedusae, is a bit bigger than the zooplankton the cross jellies eat. The crystal jelly eats copepods, and other planktonic creatures, comb jellies, and other jellyfish. The crystal jelly can get its mouth (underneath the bell) open wide enough to eat animals half its size. Try that sometime — it’s not easy! . Aequorea victoria are found along the North American west coast of the Pacific ocean from the Bering Sea to southern California. The medusa part of the life cycle is a pelagic organism, which is budded off a bottom-living polyp in late spring. The medusae can be found floating and swimming both nearshore and offshore in the eastern Pacific Ocean; this species is particularly common in Puget Sound. Aequorea medusae are eaten by the voracious scyphozoa Cyanea capillata, commonly called the Lion’s Mane Jelly, as well as ctenophores, siphonophora and other hydromedusae, including documented cases of cannibalism. Many larger specimens are found with the parasitic hyperiid amphipod Hyperia medusarum attached to the either the subumbrella or exumbrella; these amphipods may burrow into the jelly, but such activities are not lethal to the jellyfish. Bioluminescence is simply light produced by a chemical reaction which originates in an organism.It can be expected anytime and in any region or depth in the sea. Bioluminescence is a primarily marine phenomenon. It is the predominant source of light in the largest fraction of the habitable volume of the earth, the deep ocean . In contrast, bioluminescence is essentially absent (with a few exceptions) in fresh water. Bioluminescent bacteria occur nearly everywhere, and probably most spectacularly as the rare "milky sea" phenomenon, particularly in the Indian Ocean where mariners report steaming for hours through a sea glowing with a soft white light as far as the eye can see. Bioluminescence of Aequorea, as in most species of jellyfish, does not look like a soft overall glow, but occurs only at the rim of the bell (the localization of bioluminescence in jellyfish appears to be genus- or species-specific), and would appear as a string of nearly-microscopic green lights, given the right viewing conditions. The luminescent light produced by Aequorea is actually bluish in color, attributable to a molecule known as aequorin, but in a living jellyfish it is emitted via a coupled molecule known as GFP, or green fluorescent protein, which causes the emitted light to appear green to us. It is not well understood how and why jellyfish use their bioluminescent capabilities, or what biological function this serves. Jellyfish do not flash at each other in the dark, nor do they glow continuously. 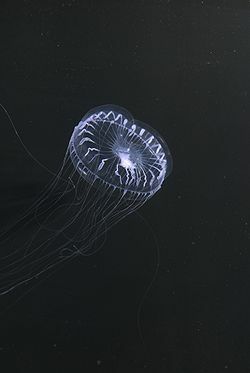 Whereas scientists who study jellyfish bioluminescence can easily stimulate medusae and thereby see their bioluminescent response, this is rarely seen in undisturbed animals. Shimomura together with Martin Chalfie and Roger Y. Tsien were awarded the 2008 Nobel Prize in Chemistry for the discovery and development of this protein as an important biological research tool. Originally the victoria species was supposed to designate the variant found in the Pacific, and the aequorea designation was used for specimens found in the Atlantic and Mediterranean. The species name used in GFP purification was later disputed by M.N. Arai and A. Brinckmann-Voss (1980), who decided to separate them on the basis of 40 specimens collected from around Vancouver Island. Tiny jellyfish, including Aequorea, are asexually budded off their hydroid colonies in early spring in the Puget Sound / Strait of Georgia region of Washington State and British Columbia. Aequorea medusae used to be enormously abundant during the summer in Friday Harbor, Washington, during at least the 1960s through the 1980s. Hundreds of thousands of medusae were harvested during that period by scientists interested in their luminescent properties. Aequorea medusae have become relatively scarce in the 1990s and 2000s and we do not know why - this change does not seem to be due to overcollection. In fact, numbers of all 75 or so species of hydromedusae are substantially down in the region now (thus exonerating the biologists who collected large numbers of only one of two of the species), but the decrease in Aequorea is especially noticeable since they are relatively large and used to be so plentiful, dominating the summer surface plankton. Knowledge about the ecology of the benthic polyps now seems even more important for understanding the present trend. there has been an enormous change from the late 1970s to the present, particularly in numbers of Aequorea, and in a 30-year data set, yet to be fully analyzed, shows these vast jellyfish declines in Friday Harbor. Crystal Jelly Monterey Bay Aquarium. Web. Accessed December 3, 2012. Haddock ,Steven. Bioluminescence web page The Bioluminesce web page. Web. Date-of-last-update Oct. 31, 2012. Tangient LLC. Crystal jelly LHSVirtualZoo. Web. Date-of-access Dec. 13, 2012. Monterey Bay Aquarium Foundation. Crystal jelly Monterey Bay Aquarium. Web. Date-of-accessed Dec. 13,2012. C. E. Mills. Bioluminescence and other factoids about Aequorea, a hydromedusa Bioluminescence and other factoids about Aequorea, a hydromedusa. Web. Date-of-last-update Jan. 11, 2009. Chen, Steven. Aequorea victorea Mr. Jensen's Virtual Zoo. Web. Date-of-access Dec. 13, 2012. EOL. Aequorea victoria EOL. Web. Date-of-access Dec. 13, 2012. CC-BY-SA. Crystal jelly tiny zoo wiki. Web. Date-of-access Dec. 13, 2012.